Enjoy the architectural marvels that Amber Fort and Palace, Jal Mahal, Hawa Mahal, etc. Visit to The Mehrangarh Fort, The Rao Jodha Desert Rock Park, The Jaswant Thada, etc. Visit to City Palace, boat ride in the Pichola Lake, Lake Palace, Bagore Ki Haveli etc. The state of Rajasthan has marvels unending in store for tourists who seek the place. Not just forts and palaces that take us back to the state’s regal past, but also lakes and hills that gift us with opportunities to indulge in some exploration and adventure activities – not to mention their sprawling deserts and the many activities and experiences that come with it. Bring your artistic self to life by enjoying the numerous fests and fairs that sketch out Rajasthan’s vibrant folk arts. Their cuisine, too is something distinct and hence a must-try. The city of Jaipur needs no introduction. Known as ‘Pink City’ it is the capital of Rajasthan and, along with Delhi and Agra, forms India’s ‘Golden Triangle’, a much sought after tourist circuit. It is also the gateway to the other popular tourist destinations in the state. From the palaces, forts, hills and lakes to elephant rides and puppet shows, Jaipur has a vibrant array of experiences in store for you, with many avenues to explore their cuisines. After freshening up at the hotel post arrival, you can head out for an exciting day at the ‘Pink City’. Start by visiting the marvellous Amber Fort, situated in the banks of Maota Lake, amidst hills, about 11 kms away from the city. You can witness a unique blend of Indo-Islamic architecture here. The fort and palace essentially has many gardens, temples and courtyards. Hawa Mahal is another marvel located close to the city. Built in 1799 by Maharaja Sawai Pratap Singh, this five storied building has about 953 windows, each decorated with intricate designs. Hawa Mahal is also called the Palace of Winds. Drop by at the City Palace. Next to City Palace is Jantar Mantar is another intriguing place with sculptures that has astronomical purposes like predicting eclipses and keeping a track of the stars. Nahargarh Fort, Jaigarh Fort, etc. are reflections of the city’s royal past. Jal Mahal, a palace located in the middle of a lake, too, is an astonishing sight. Please the shopaholic in you by visiting the many markets lined in and around the city. Pushkar, with all its numerous ghats and temples, is bound to be a spiritual experience to you. Apart from visiting the beautiful and serene ghats, visit places of worship like Brahma Temple, Varaha Temple, Gurudwara Singh Sabha. Enjoy the scenic beauty of the Pushkar Lake and indulge in activities like camel safari and hot air balloon rides. There are ample avenues for shopping. Camping in the deserts will be memorable moments in your trip. Known by names such as the Sun City or the Blue City, Jodhpur is situated in the Thar Desert and was founded by Rao Jodha in 1459. Jodhpur main attractions are its many forts and palaces and other activities such as zip-lining and trekking. Start your day by visiting one of the largest forts in India – The Mehrangarh Fort. Bulit out of red sandstone, the fort stands as a stark contrast to the stretch of blue houses (which gave the city the name ‘Blur City’) that it overlooks. The fort, with high walls for boundaries is situated 410 feet above the city. Make the day adventurous by going for zip-lining with the Flying Fox Jodhpur. Enjoy nature’s beauty at The Rao Jodha Desert Rock Park. You can also visit The Jaswant Thada, a cenotaph built by Maharaja Sardar Singh in memory of his father. The clock tower in the city and the markets surrounding it will tend t your shopping wishes. The ‘City of Lakes’, has beautiful lakes, wildlife sanctuaries and palaces. Founded by Maharana Udai Singh II in 1553, Udaipur is also known as the ‘Venice of the East’. Make sure to drop by at some of the festivals happening in the city to understand Rajasthan’s rich folk culture. 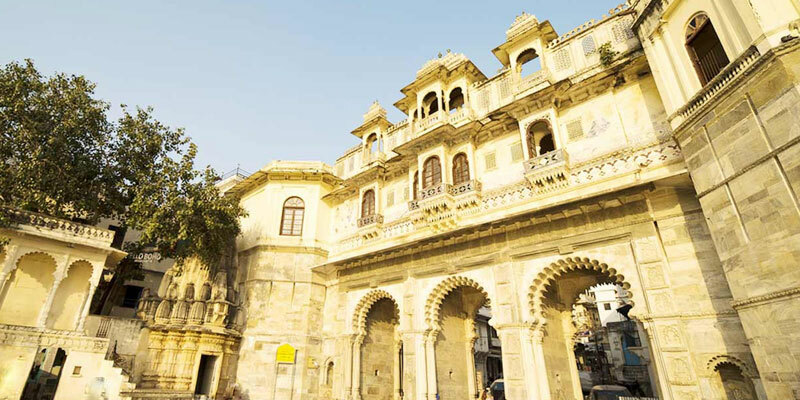 City Palace, situated in the banks of Lake Pichola is constituted by four major and other minor palaces and is a good place to begin your city tour. As you go for a boat ride in the Pichola Lake, drop by the palace-turned luxury hotel, Lake Palace. Bagore Ki Haveli is a good place to visit if you are interested in knowing more about Mewar’s culture. The grounds of Garden Hotel showcases an array of their vintage car collection. Shilpgram, a traditional centre for arts and handicraft, is vibrant shopping hub. Spent your evening and watch the sunset at Monsoon Palace. Our executives will pick you up from the hotel and drop you to the airport or railway station for departure. The vibrancy that Rajasthan has lent your soul is bound to stay for a long time. Friendly and safe drivers and their charges.